The aims of this study were (1) to evaluate subjective symptoms in the hand-arm system of all traffic police motorcyclists of a city located in the central part of Japan and (2) to assess their hand-arm vibration exposure associated with traffic police motorcycle riding. The study population consisted of 119 motorcycling traffic policemen and 49 male controls. By means of a questionnaire, information on the occupational history and the presence of subjective symptoms in the hand-arm system of all subjects was obtained. Vibration was measured on the handlebars of the representative motorcycles and on the hands of the riders. The 4- and 8-h energy-equivalent frequency-weighted acceleration as well as the lifetime vibration dose were calculated for all police motorcyclists. The prevalence of finger blanching in the traffic police motorcyclists was 4.2%, but none of the controls had this symptom. The rates of finger numbness (19.3%), finger stiffness (16.0%), shoulder pain (13.4%), and shoulder stiffness (45.4%) were significantly higher among police motorcyclists as compared with controls. The root-mean-square (rms) frequency-weighted acceleration on the handlebars of police motorcycles was in the range of 2.2–4.9 m/s2 rms. The computed 4- and 8-h energy-equivalent frequency-weighted acceleration values were 2.8– 4.5 and 2.0 –3.2 m/s2 rms, respectively. A pattern of increasing percentage prevalence with increasing cumulative vibration dose was noticed. The subjects with a lifetime vibration dose of more than 20.1 m2 h 3 s-4 (ln scale) showed significantly higher prevalence rates for symptoms in the fingers and shoulders as compared with the control group. 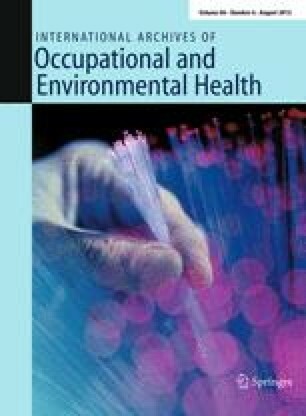 As occupational vibration exposure of traffic police motorcyclists might be considered a risk factor for the development of symptoms in the hand-arm system of the riders, its evaluation and control is needed for prevention methodology evolution.